Despite the film having a disappointing box office debut, Solo: A Star Wars Story featured a handful of undeniably enjoyable elements. Alden Ehrenreich's and Donald Glover's respective performances as young Han Solo and young Lando Calrissian were highlights for many viewers, and plenty of critics (even the ones who didn't completely love Solo) applauded the movie for its "fantastic action sequences … and a story you can get behind." But perhaps the best thing about Solo: A Star Wars Story was a head-turning moment no one saw coming: the Darth Maul cameo near the end of the film. Casual Star Wars-loving audience members shifted to the edge of their seats and let out a few squeals of shocked joy when the one-time apprentice to Emperor Palpatine appeared as a mechanical-legged hologram, but no one had a better reaction to the surprise sequence than Star Wars franchise actor Ewan McGregor (Obi-Wan Kenobi to us Star Wars fans). 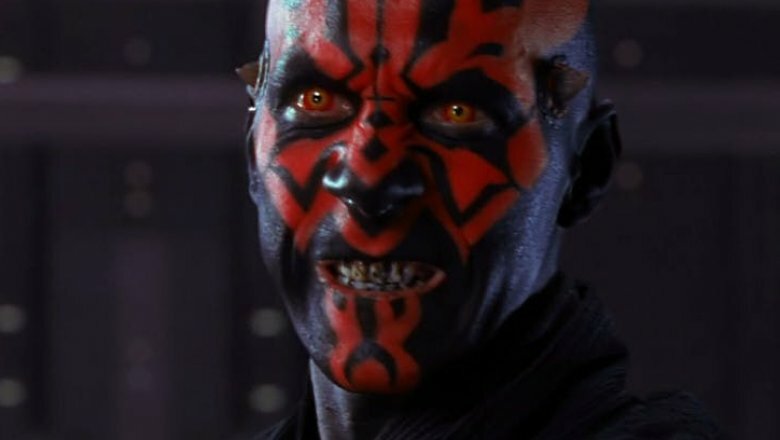 Ray Park, the actor and stuntman who first played Darth Maul in 1999's The Phantom Menace, shared with The Star Wars Show McGregor's hilarious response to the Darth Maul cameo, detailing that McGregor completely freaked out when the double-horned villain's red face popped up on screen. As Park tells it, he and McGregor were sitting next to one another watching Solo: A Star Wars Story in theaters, and when Maul resurfaced, McGregor grabbed Park's arm and shook him so hard and fast that Park hardly got to see his own appearance. But Park didn't missing the jaw-dropping moment his infamous ex-Sith character was revealed as the head of the Crimson Dawn syndicate in Solo. Park was genuinely touched by McGregor's giddy, exuberant, somewhat childlike reaction to seeing Darth Maul on the silver screen again for the first time in over 20 years. "It was so nice for him to be like that with me, and to hear that reaction [to Maul] in a movie theater. I heard stories about it in '99, where people were going crazy, so to sit there and experience that with my kids, and my son turned over to me and went, 'Oh, this is the movie you're doing?' It was a thrill," said Park. "I'm so grateful." It's not hard to believe that McGregor had such an intense reaction to Darth Maul's Solo cameo. As we mentioned before, the devilish antagonist's involvement in Solo marks the first time he's been in a main Star Wars film in more than two decades. That's worthy of widened eyes, unbridled applause, and arm shakes of the McGregor variety on its own, but the fact that Solo screenwriters Jonathan and Lawrence Kasdan included Maul in a clever way adds another layer of coolness to the already excellent cinematic cake. Instead of sticking Maul in as an awkward footnote or forcing the former Sith into the story as some kind of narrative asterisk, the Kasdans and director Ron Howard added Park's iconic character in as the true operator of Dryden Vos' (Paul Bettany) ring of criminals. After viewers learn that Qi'ra — the "woman of many identities," as Entertainment Weekly's Anthony Breznican once described her — is really a lieutenant for the Crimson Dawn, they watch as she double-crosses Han and Vos, and then rings up Darth Maul to inform that Vos' mission failed and that she intends to assume his position within the syndicate. The only tricky thing about Maul's cameo in Solo is that it confused audience members as much as it hyped them up. Many believed that Qi'ra calling Maul may have taken place before The Phantom Menace, which would mean that Anakin Skywalker is actually younger than Qi'ra and Han, which would in turn make zero sense considering Han and Anakin's son Luke (Mark Hamill) are roughly the same age. In reality, Solo is set 20 years after The Phantom Menace and about 11 to 14 years prior to A New Hope, so the Star Wars timeline remains firmly in tact and totally un-jumbled by Maul's Solo cameo. As for whether Star Wars loyals and the easily excitable McGregor will ever get to see Darth Maul in a future franchise entry, Park is down if the bigwigs at Lucasfilm are. The actor previously told Forbes, "If anything ever happens in the future and the character is back, and it's me? I have a lot of great ideas of what I'd like to do with it."